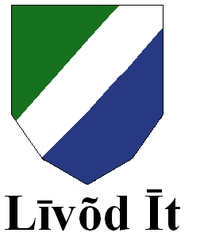 The main sym­bol used by the Livo­ni­ans, is the Livo­ni­an flag, adopt­ed by the Livo­ni­an Union (Līvõd Īt) at its first meet­ing on March 2, 1923. Raised for the first time at the Livo­ni­an fes­ti­val in Irē on Novem­ber 18, 1923, the green, white, blue ban­ner was designed to reflect the life and world of this nation of fish­er­men. The green is sym­bol­ic of the coastal forests, the white of the white sands of the coast, as well as, the bright thoughts and feel­ings of the fish­er­men think­ing of their homes and fam­i­lies, the blue of the deep blue waters of the sea. The pro­por­tions of the flag are 2:1:2, the same as those of the Lat­vian flag. (Šuvcāne 1995:134) Dur­ing the years of the Sovi­et occu­pa­tion, use of the flag was for­bid­den, but with the reestab­lish­ment of Lat­vian inde­pen­dence in 1990, it once again became the stan­dard sym­bol used by the Livo­ni­an peo­ple and their cul­tur­al orga­ni­za­tions. The Livo­ni­an nation­al anthem “Min izāmō, min sindimō” (My Father­land, Land of my Birth) has the same melody as the Finnish and Esto­ni­an nation­al anthems. 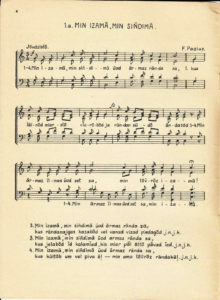 The image below shows the text of the Livo­ni­an anthem as it appeared in Kōr­li Stalte’s (Kārlis Stal­te) 1929 col­lec­tion of Livo­ni­an songs. Click here for the text of the anthem writ­ten in the present-day orthog­ra­phy. Kar­ma, Tõnu. (Tenu Kar­ma). 1995. “Lībieši.” (The Livo­ni­ans.) Kurze­me un Kurzem­nieki. Ed. A. Vītols. Rīga: Latvi­jas Encik­lopēdi­ja. Stal­te, Kōr­li (Kārlis Stal­te). 1929. Līvõkīel lōlõd. (Livo­ni­an Songs.) Helsinki: Wikstedt’in kiv­drukkõs. Šuvcāne, Val­da. 1994. “Lībiešu kultūras dzīve 20. gad­sim­ta 20. un 30. gados.” (Livo­ni­an cul­tur­al life in the 1920s and 1930s.) Lībieši. Rīga: Zināt­ne.